[The Oxford Canning, Chatham and New Tory Clubs.] Eleven printed items, including a list of 'Resident Members', three menus, six seating plans, and a newspaper cutting. Oxford. Between 1910 and 1914. 10 printed items. In aged and worn condition, with seven items showing evidence of removal from an album and three items still attached to separated leaves from it. Comprising three card menus, five seating plans, a list of 'Resident Members' and a newspaper cutting. The Oxford New Tory Club was a university club to promote and discuss Tory principles, founded in 1861. Its records are in the Bodleian Library. ONE to THREE: menus for the years 1912, 1913 and 1914. Each a bifolium on card of 3pp., 12mo. Printed notice from the General Manager of the South Eastern and Chatham Railway's Managing Committee, headed 'Government Control of Railways. Free conveyance of traffic carried on behalf of the Admiralty or War Office'. [London.] Dated in print 10 October 1916. Manuscript order, signed by Bickerton ('R Bickerton') and Hulbert ('Jno. Se. Hulbert'), directing Bathurst, as Captain of HMS Fame, to proceed to Chatham, to be paid off. Given onboard [sic] the Prince at Spithead, 11th. Septr: 1814'. One page, on the recto of the first leaf of a bifolium (leaf dimensions 32 x 20 cm). 14 lines. Text clear and complete. 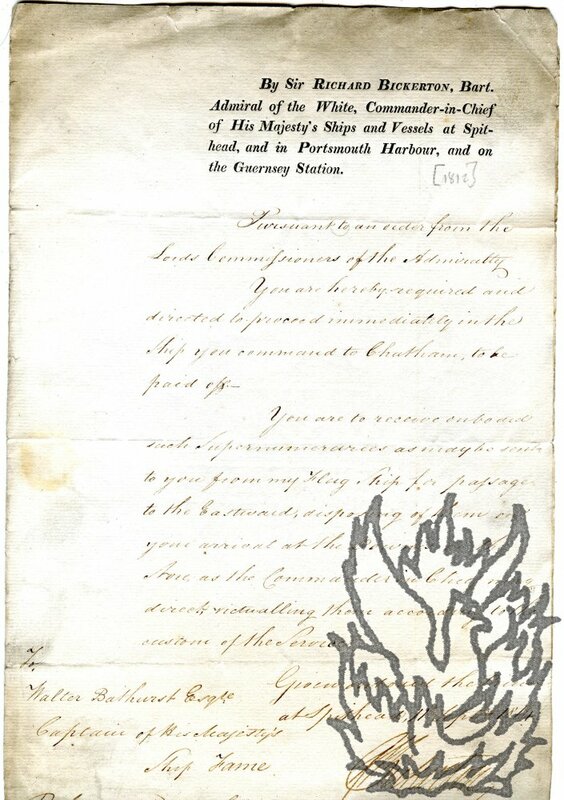 On aged and somewhat grubby laid paper with Britannia and 'GATER | 1811' watermarks). Chipping and wear at head and extremities. Printed at head: 'By Sir RICHARD BICKERTON, Bart. Admiral of the White, Commander-in-Chief of His Majesty's Ships and Vessels at Spithead, and in Portsmouth Harbour, and on the Guernsey Station.' Written in a secretarial hand and signed by Bickerton and, 'By Command of the Admiral', by Hulbert.